Parents’ Day celebrates and recognizes the important role of responsible parenting in every day family life. Families are a fundamental human institution, bonded by unconditional love and commitment. Parents’ Day was established in 1994. In a time where society had become increasingly self-centered, President Bill Clinton signed a congressional resolution to commemorate Parents’ Day in an effort to promote family commitment and parental responsibilities. At GPO we offer publications to further the appreciation and understanding of what great parenting can realize, to self, to your children, and the community. Take a look. Good advice for parents on how you can help your children be successful at each stage of their school life: from preschool, elementary school, middle school to high school. The booklet stresses the importance of a parent or caregiver’s influence and involvement in his/her child’s education process and schooling activities. In this colorful booklet parents will learn more about the role vaccines play in keeping their children healthy. This guide is geared to parents and guardians of young people ages 10 to 14. It’s a handy booklet designed to help parents teach kids about the dangers of drinking alcohol. In honor of National Parents’ Day, celebrated the fourth Sunday of July, Government Book Talk reviews this exemplary parenting guide from the Department of Education, Parent Power: Build the Bridge to Success. The book’s introduction sets the reader up to learn the most important tip given in Parent Power and its Spanish version, Poder De Los Padres Para Trazar el Camino Hacia el Exito, This tip is simple to state, but hard work to follow: be responsible. Your responsibility for your child’s education begins with modeling at home. If your kids see you reading, they will want to read. If you drag your kid to every Civil War battle site because you are a Civil War buff, your child may ace his or her American history exams. When you volunteer at your child’s school, your kids are going to see how important their education is to you. Other tips covered in the book include: be committed, be positive, be patient, be attentive, be precise, be diligent, be results-oriented, be innovative. These tips are good calls to action for parents. Parents are already tired from their jobs, long commuting hours, keeping their living spaces clean and finding a way to feed the family. Just managing the basic tasks of daily survival can take up all their time. When your child throws a temper tantrum because you’ve sent her to her room to do her homework rather than watch her favorite TV show, it’s tough to practice that “be patient” tip. Good parenting demands more effort than managing basic survival. Likewise, it takes a great deal of work to follow the other tips, such as remembering to be innovative and to provide positive feedback. It’s more constructive for parents to be precise when praising their children. Instead of telling your child she is smart for completing a drawing, you should tell the child how much you appreciate her making the effort to color the Canadian flag with the right colors in the right places. Parents will evaluate many of their children’s performances, and it will take quite a bit of creativity to say “good job!” in a different way every time. The last tip given in all bold case letters, BE THERE, is a restatement of the popular saying, the best present parents can give their kids is their presence. The book does give specific suggestions, listed by school age group: birth through preschool, elementary, middle and high school. 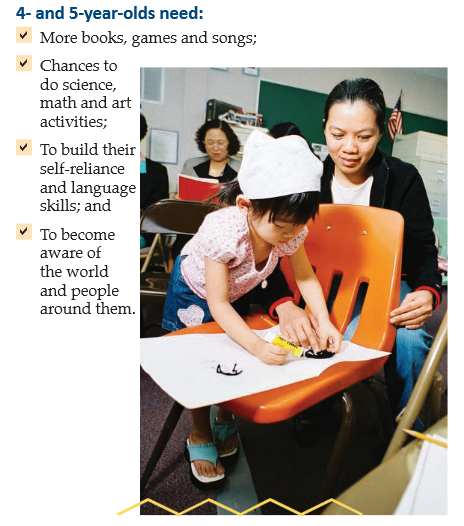 Image:Parent Power, Page 12, recommends activities for Pre-Schoolers and Kindergarteners. The authors recommend a large number of parent-child and pro-school activities. Some examples are reading aloud to your child each day starting at birth, taking your child to the library, playing games with your child, contacting his or her teachers, visiting his or her school. Many parental advice volumes contain advice that may not be revolutionary, but may break parents out of a rut that they had not previously considered. There is also a list of electronic resources to help parents research further. Hints and tips are a parent’s best friend when guiding a child through the various developmental stages. If you’re doing the fun but difficult work of raising a child, help yourself to Parent Power: Build the Bridge to Success and/or Poder de los Padres: Para Trazar el Camino Hacia el Éxito. Get the hints and tips you need to encourage you. Children do not simply inherit their characters from their parents like magic. Parents are the driving force in their children’s lives, both by example and character—and that’s the power of parents. How can I find parenting publications from the Federal Government? Federal Depository Librarians: How can I access these publications? Find the records for these titles in the Catalog of Government Publications. Many of our personal characteristics, such as where we are born, the color of our eyes, our native language—are due to luck. If we get good parents, this is due to luck, too. When we become parents ourselves, though, we need to rely on our own hard work. Being a parent is the happiest and hardest job I’ve ever had, and I know many people say the same. Any help you can get with that job, whether it is from your own parents, friends, your child’s teachers, parents of your child’s friends, is welcome. As the African proverb goes, it takes a village to raise a child. The Federal government wants to be part of that village, and provide parents with any assistance it can give. And with Father’s Day this Sunday, the Government Printing Office wants to highlight these terrific Federal publications and websites to help Dads be all they can be. Whether he’s called Papi, Papa, Pop, Baba, Daddy, Da, Abbu or just plain Dad, celebrate the fathers– and father figures– you know by sharing these resources with them. The Government supports fathers in many ways; one of them is through the National Responsible Fatherhood Clearinghouse at Fatherhood.gov. Dads can check out this site to find fatherhood programs and resources, connect with mentors, read the latest blog posting on DadTalk, and take the Fatherhood Pledge. Eleven Federal partners are involved in the Responsible Fatherhood Working Group: the Departments of Agriculture, Commerce, Education, Health and Human Services, Housing and Urban Development, Justice, Labor, Veterans Affairs, the Corporation for National and Community Service, the U.S. Equal Employment Opportunity Commission, and the Office of National Drug Control Policy. The level of Federal investment shows how seriously the President and the Federal Government takes this initiative. Another way to reap the benefits of Federal support of fathers is to read Federal government publications prepared in support of responsible fatherhood. Promoting Responsible Fatherhood: Every Father Taking Responsibility for His Child’s Intellectual, Emotional, and Financial Well-Being discusses the various programs and initiatives that President Obama has been promoting as part of his Fatherhood and Mentoring Initiative, including the Head Start-sponsored Fatherhood First program (see poster on the left). 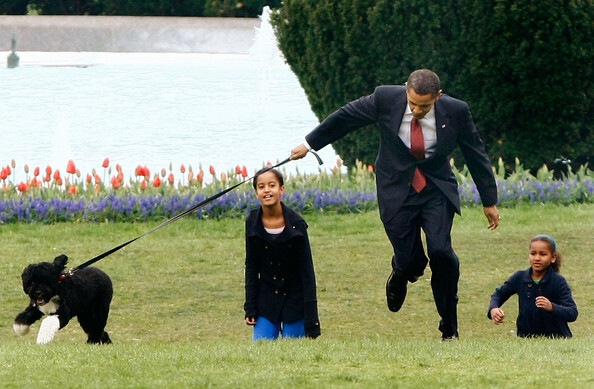 “I came to understand the importance of fatherhood through its absence—both in my life and in the lives of others. I came to understand that the hole a man leaves when he abandons his responsibility to his children is one that no government can fill” (p. 2). To keep that void from opening, the Federal Government has started the aforementioned initiative, and the president has asked for Federal budget support for the Child Support Enforcement Program and to sustain funding for the Healthy Marriage and Responsible Fatherhood grants. This book discusses these and similar Federal Government programs started and/or supported by the Obama Administration, and what the programs have done to help fathers and their families. This volume is mostly a high-level program summary of interest to policy wonks, public policy workers, social workers, local government officials and students of those disciplines. However, the general public can also glean information about what resources they can get from the Federal Government to assist their families. At the document’s end, there’s a list of things fathers, individuals, NGOs and places of worship can do to support fatherhood in their own communities as well. The document’s authors try to show how the Federal government stretches out a hand, but it ends on a note of helping oneself, much like the next volume. Download an electronic copy of Promoting Responsible Fatherhood: Every Father Taking Responsibility for His Child’s Intellectual, Emotional, and Financial Well-Being for FREE from GPO. Dad’s Play Book: Coaching Kids to Read is geared to get dads to help their kids to read, using case studies and helpful tips. The writers use two of the most important behavior modification tools at their disposal: we all want to be like our peers (hence the case studies) and men love sports (hence the extended coaching metaphor). Twenty dads are profiled on how they are helping their kids learn to read, giving their names, photos, occupations and ages, so they’re more relatable to readers. The middle pages cover five skills that children need to have mastered to be readers by third grade; everyone who has responsibility for a pre-K through 3rd grade child should be taking some time to study this cheat sheet. Each tip has a paragraph subtitled, How Can a Dad Help? that gives specific suggestions for a dad to improve reading—for example, with fluency. This title is short but sweet; there’s a lot more to know about helping a child learn to read, but this friendly, picture-filled piece is definitely worth the time it takes not only to read it, but to study it and employ in your life as well. download an individual electronic copy for FREE here from GPO. How can I find these publications: Promoting Responsible Fatherhood: Every Father Taking Responsibility for His Child’s Intellectual, Emotional, and Financial Well-Being and Dad’s Play Book: Coaching Kids to Read? Find the records for these titles in the CGP. Buy a package of 25 printed copies of Dad’s Play Book: Coaching Kids to Read from GPO’s US Government Bookstore.